This five-day summer camp was organized by the Washington Architectural Foundation and the Girl Scout Council of the Nation’s Capital that seeks to use design and the arts to enhance STEM (Science, Technology, Engineering, Math) skills. Every day last week, a group of ten or so volunteers from architecture and engineering firms across the city arrived at the District Architecture Center to teach a group of 40 girls and boys (mostly girls) about the basics of architecture, planning, and construction. The task for the week was to build a special space for themselves that would support their hobbies and interests in a 6’x6’x6′ cube. They were taught to think through what uses their building had to support, for example, if they like to read, they need a library and reading space. After being given a remote mountain lake site, they designed and built their space for the immediate context. They were asked to consider transportation and site constraints in this remote location, and take scale into account when thinking about what would fit in their cube. Each group assisted in building a true-to-scale box to help them feel the space requirements. The box was developed throughout the week to include insulation and siding. We look forward to seeing the final designs of these industrious young people. 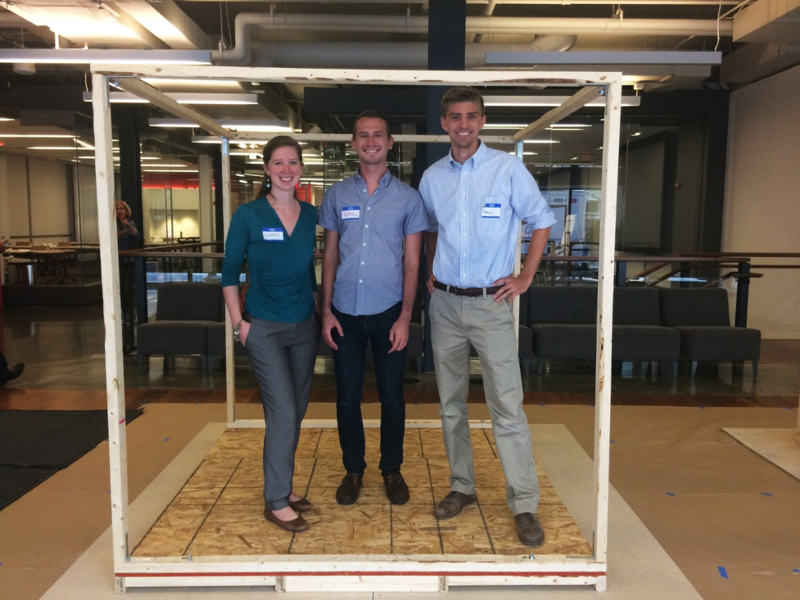 CannonDesign’s DC office committed 3 volunteers to working Monday morning: Andrew Bickell, Daniel Olberding, and Carrie Parker. I enjoyed the brainstorming and sketching session with all of the campers. Each group was excited to develop their own creative and unique spaces based on their interests and it was fun to help them bring those ideas to life. I really enjoyed seeing the campers light up when the group proudly shared their brainstorming ideas. One camper politely and eagerly asked another if she could PLEASE copy one of her ideas. It was a great example of teamwork. My favorite group was the group of 5 entrepreneurial ladies who turned their hobby-houses into money-making ventures, as well as an inclusive friend community with all of the amenities. Their lake-adjacent property was accessible by nearby helipad and each tree house was accessible by zipline and ski lift.